It was probably my grandfather that taught me how to fly fish. I don't really recall but I know that the only time I would pick up a fly rod as a kid was when I was fishing Rocky Mountain creeks with him. Other times my grandfather and I would be using our spinning rods to try and catch our fish. Since those days as a teenager I have learned a lot about fishing, especially fly fishing. After I got my drivers license my fishing took on a whole new approach. I had freedom to go and fish wherever I wanted to. My fishing buddy and I would explore all the spots we knew of. We almost always took just our spinning rods. We were young and didn't know better. There were many years that we knew it wasn't fishing we were doing, it was biting. We didn't hope to catch a fish, we just hoped for a bite, one bite, that wasn't much to ask for. We caught a fish here and there but never had that much luck. My luck was about to change. A few years later the father of a friend of mine got a new fly rod. He didn't do much fishing but still ended up with a nice new expensive fly rod. His wife and daughter one day convinced the two of us to go fishing together. Seeing that I couldn't ever turn down the opportunity to fish we headed out. We didn't have to go far since there was a pond about a quarter mile from his house. When we got there I had a choice to make. 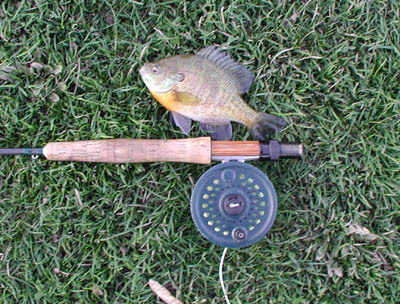 Would I fish with my spinning rod or would I use my fly rod since my friend's father was using his fly rod. Typically I would have used my spinning rod since it was a pond and not a river but since he was using his new fly rod I decided to use mine too. I didn't know at the time how much my life was about to change because of the decision I had made. The two of us started to fish this pond and within a few minutes I had a nice bluegill on the end of my line. I had decided to fish a dry fly since that was all I really knew to use with a fly rod. I would twitch the fly across the surface or watch it underneath if it started to sink. This was enough to entice about a dozen fish to my fly in the course of an hour. Until this day I never had a day that I caught more than a couple of fish, and now I had caught a dozen in an hour. I was converted. From that day forward I have never turned back to my spinning rod. My fly rod is the only option I have, it's the only rod I need. 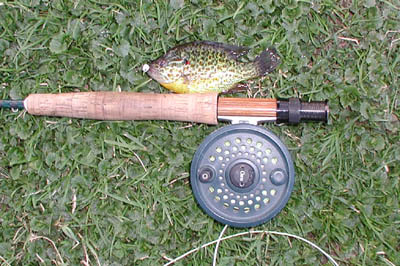 My spinning rod sits at my parents house where I left it years ago, my fly rod is in the back of my car.